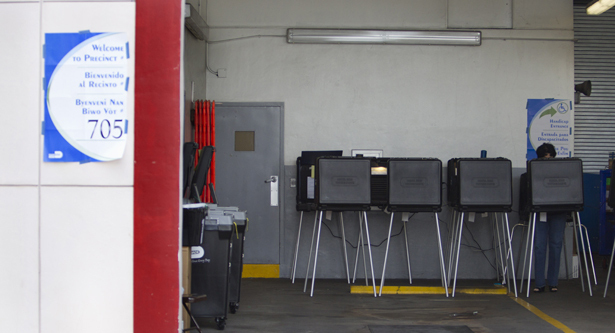 Many of Florida’s ex-felons are receiving conflicting information on their voting rights. That could spell disaster in November. Despite the heat and threat of thunderstorms, about 500 African-Americans are gathered in Rowlett Park for an end-of-summer day of barbecuing, dancing and playing cards. It’s the fifth annual Old School Picnic, a community park jam that brings together two black neighborhoods that were torn apart when the College Hill and Ponce de Leon public housing projects were razed in 2000. Earlier that morning, President Barack Obama held a massive campaign rally in nearby St. Petersburg, trying to turn out every last vote in this key swing state. The week before, Republicans had made their big bid for Florida at their national convention. But before the folks gathered in Rowlett Park decide who to vote for, they’ll have to tackle what should be a much simpler question: Are they even eligible to vote? Trying to answer that question is what brought Yvette Lewis, the political action chair of the Hillsborough County NAACP, to the picnic. The folks in Rowlett Park come from multiple generations of working-class Tampa families, and Lewis seems to be on a first-name basis with most of them. She threads herself through the clusters of tents, stopping every so often to catch up with a friend or family member, but more often to ask people if they’re registered to vote. “Do you know your status?” she inquires, meaning primarily whether they are eligible to vote because of past felony convictions. Lewis runs into Blair Bass, a 44-year-old customer service attendant. He was released from prison in 2009 for a felony conviction from 2001. Upon release, he says he was notified by the state’s elections division that his voting rights had been restored. A few months ago, Bass received another letter from the county telling him that he’s no longer eligible to vote because of his felony conviction. This confused him, because the county had also just sent him his voter identification card. He displays it from his wallet; it shows he registered in April 2011. Bass wants to know if he should vote in November, but Lewis can’t be sure if he qualifies. She’s worked for years trying to get more black people to the polls, so it pains her to say what comes next. She tells Bass, as she has many others like him, not to vote. Lewis fears that the former felons are headed into a “trap” set for them, and for the whole voting rights movement—one in which confused felons could end up in legal trouble and accused of voter fraud. Her suspicions are not unfounded. An organization called Tampa Vote Fair has been besieging the county supervisor of elections with alarmist cries of ex-felon voter fraud. No such fraud has been found in the county, but the group has managed to cloud public opinion on its existence either way. And thanks to multiple changes in election law since 2007—including draconian new measures signed by Governor Rick Scott in 2011—state and county election officials seem just as confused about which ex-felons can and cannot vote. Lewis’s booth sits in a broad patch of treeless green space, where no one can miss it. She and her colleagues are surveying the crowds at Rowlett Park, looking for the formerly incarcerated so that they can encourage them to “check their status.” The women bring each person over to their booth to see if his or her name is on a list of 1,816 felons who have had their voting rights restored. If the name’s there, the person is eligible to vote and can register on the spot. If it’s not, then they are potentially ineligible, and they’re sent to the county supervisor of elections’ booth a few feet away, where an election official helps them begin the process toward restoration. There is a five- to seven-year waiting period under Governor Scott’s new rules. Before 2007, Florida was one of three states that permanently disenfranchised all ex-felons. But Governor Charlie Crist amended the rules so that nonviolent ex-felons could more easily have their voting rights restored. According to the Brennan Center for Justice, the voting rights of more than 150,000 Floridians were restored as a result. As soon as Scott took office in 2011, he began to reverse Crist’s reforms. Now, those with non-serious felonies have to wait five years after release from jail (seven years for serious felonies) before they can be considered for rights restoration—and then only if they’ve been crime-free during that period. In addition, Scott expanded the serious felonies list to include other crimes, notably those involving drug trafficking. If you have unpaid restitution, you’re ineligible for restoration, and to apply for a hearing, you must obtain copies of all original court documents connected with your case. By the end of 2011, only seventy-eight former felons had had their voting rights restored under Scott’s new rules, as reported by the Florida ACLU. For those who have had their rights restored, even as carry-overs from the Crist administration, few are aware that they can, in fact, vote. A few days after the picnic, Lewis is in the NAACP office sorting through sheets of names of people who have contacted her over the past few weeks about their access to the vote. Many of them have received conflicting information from the county, and they need Lewis to help them sort it out. One woman has a voter identification card that shows she registered to vote on February 7, 2012, and reads “You are currently eligible to vote in Hillsborough County.” But she also has a letter from the county dated March 7 that states, “The Hillsborough County Supervisor of Elections office has received information from the State of Florida that you have been convicted of a felony and your civil rights permitting you to vote have not been restored at this time.” The letter includes a “Voter Acceptance or Denial” form that she must fill out and send back or she will be permanently removed from voter rolls. Lewis shows me a half-dozen other files of people with the same set of conflicting documents from the county. It’s not advice that Lewis likes to give, and it’s not advice that many like to seek out in the first place. Halfway through the picnic, only about twenty people have visited either the NAACP or county officials’ booths, which are cordoned off from the rest of the picnic. But what they don’t know about their voting status can hurt them as badly as a virus, because Tampa is a place where people like those at Rowlett Park desperately need a voice in government. Twenty-six percent of the population is black, and nearly one in five city residents lives below the poverty line. A July report from the Sentencing Project shows that Florida has the distinction of being the felony disenfranchisement capital of the nation, with more than a million of its citizens struck from the rolls. Nearly a quarter of all African-Americans of voting age in Florida are affected by the felon laws, as are one in thirteen black adults nationally. Nearly 8 percent of African-American adults are disenfranchised, as opposed to less than 2 percent of the non-African-American population. It’s actually the obligation of the Florida Parole Commission to make sure these legions know whether or not their rights have been restored. The state does send out letters notifying them of their new rights, but because of the often transient status of those just out of prison, many of the letters come back to the state as “undeliverable.” A public records request from the ACLU revealed that 17,604 such notices were returned to the state. More than three-quarters of those who weren’t properly notified of their restored rights are unregistered and may not know that they can register, the ACLU reported in early August. So the problem for former felons is compounded: there are thousands of people unaware of their right to vote because of the state’s negligence in reaching them, and an untold number more receiving conflicting information from the county about their voter eligibility. Tampa Vote Fair has its own list of former felons, about 1,375 names from the county and 21,582 from the state—people it says are not supposed to be on the voter rolls and are poised to vote fraudulently. Local news outlets reported that Tampa Vote Fair used a database created by True the Vote, a Texas-based Tea Party group. But Vote Fair spokesman Tim Curtis says that the current list was created by the group’s leader, Kimberly Kelley, using only public records. Franken won the Senate race by 225 votes in an election and recount process widely regarded as one of the most transparent and most highly scrutinized in history. As detailed in election law expert Rick Hasen’s book The Voting Wars: “The board [commissioned to review the recount] conducted its review openly—all the ballots could be viewed on line in real time, and newspapers and radio stations allowed voters to determine the intent on questioned ballots—and, most unanimously, agreed on whether to accept or reject nearly 96 percent of the challenged ballots.” A 2010 investigation by Minnesota’s Citizens for Election Integrity, based on surveys of county attorneys, found just thirty-eight convictions of felons for voter fraud. Twenty-six former felons were found guilty of voting illegally, well below the margin of victory. Another twelve had registered to vote, but did not in fact cast a ballot. But evidence aside, Tampa Vote Fair’s felon-fraud meme is spreading through local media. On August 20, a local newscast declared, “The group says its research shows some of the felons voted while behind bars.” That’s it—no scrutiny of the claim, or even acknowledgement of the absurdity that a person behind bars could somehow manage to vote. The county has yet to verify whether his ex-felons are “illegally” registered. There’s certainly no proof that anyone on the list has voted or intends to vote. But Curtis was adamant that fraud is happening and said the news report about the felons who “voted while behind bars” was accurate as well. He told me they have evidence of five people who cast ballots while in jail. “Are you surprised by that?” he asked. Curtis wouldn’t show me his proof of the incarcerated voters, and instead cited hypothetical examples: a wife who takes an absentee ballot to her imprisoned husband, who “fills it out while on a conjugal visit.” The wife would then mail the ballot in. “It’s not that difficult to game the system,” Curtis said. Hillsborough County Supervisor of Elections Earl Lennard said he forwarded the list of 1,375 ex-felon names submitted to him by Tampa Vote Fair to the state, whose investigators are “working through the process” of verification. Until the state is finished, said Lennard, he couldn’t give information about whether any of those names represent voter fraud, from behind bars or otherwise. If fraud is found, the state’s attorney will investigate it further. Lennard reported there were 1,843 people in his county who have recently lost their voting rights because of felony convictions, and said his office had sent out 897 notification letters about this since March. When told of reports that people have received those notifications alongside voter identification cards from the county, leading to confusion, Lennard chalked it up to a “lag time” between when the state notifies the county about people who have lost eligibility, and when the county sends out cards that declare eligibility. Lennard also noted that Tampa Vote Fair has submitted multiple lists of people whose eligibility the group wants checked. It is the only group that has submitted such requests other than the state itself, which regularly hands down names to the county to be checked as part of routine list maintenance. Under Governor Scott, “list maintenance” has been a tricky issue as well. The state is the subject of multiple lawsuits over a purge program it initiated in April, in which a list of thousands of names was generated using a highly contested database-matching method. The Justice Department and civil rights organizations asked Florida to cease and desist, citing apparent violations of the National Voter Registration Act because the purge program was too close to an election. Scott defended the action, saying the state needed to root out voter fraud. A federal judge agreed and allowed the program to commence. It’s doubtful that the county is engaging in a “setup,” as Lewis puts it, but there is little doubt that Tampa Vote Fair is prepared to exploit the confusion surrounding felons’ voting rights. Nationally, the True the Vote network is mobilized to do the same. In Virginia, which also has some of the toughest ex-felon voting restrictions in the nation, the state’s secretary has agreed to process all the voter restoration applications on backlog in time for the upcoming election. The Advancement Project, a civil rights law organization, persuaded the state to bulk up its staff for the mass processing, which could affect the rights of up to 350,000 Virginians whose voting rights are in question because of past felony convictions. Tampa Vote Fair has set its sights not only on the felons looking to regain their voting rights but also on the people helping them. “They monitor everything I turn in,” says Lewis. At a recent Hillsborough County Republican Party executive committee meeting, Lewis heard members discuss keeping track of her work. Tampa Vote Fair’s Kelley is a member of the committee, despite the group’s claim to be nonpartisan. An August 21 agenda lists Kelley providing a “voter fraud research” report. Tampa Vote Fair’s work with the Republican Party aligns closely with the recent history of voter “caging.” The courts have long ruled that caging that disenfranchises minority groups is illegal, after the Republican National Committee was accused of doing it in 1981 to purge minority voters. The RNC was also accused by news media and the Democratic Party of conspiring to do it again in 2004 in five states, including Florida. Florida’s efforts at felony disenfranchisement history have deep historical roots. The first laws took hold in 1868 as a measure by the state legislature to severely limit the political power of African-Americans recently emancipated from slavery. A hundred years later, the state decided to keep these laws on the books, even though its Constitutional Revision Commission found no factual or rational basis for keeping them intact. Eight of the commission’s thirty-seven members were also part of the Johns Committee, a government commission that investigated civil rights organizations during the 1950s and ’60s for “subversive” activities.